PLEASE NOTE: If you are taken to the GoFundraise home page or 'page not found' message when you click on the password reset link, this usually means you are already logged in. 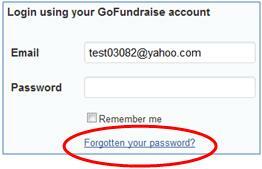 Please visit gofundraise.com.au and check the top right corner for a 'My Account' menu label to determine if you are already logged in. Click 'logout' and access the password reset link again. Verification link will expire after 24 hours.